1.) I’m thankful that all of my children and grandchildren are healthy, happy, intelligent and genuinely loving and kind spirits. I’ve been blessed more than I deserve. 2.) I’m thankful for my loyal, loving and furry forever companion, my pup, Luci. She is the keeper of all of my secrets and her furry little body holds all of my tears, happy and sad. 3.) I’m thankful for my friends who are always there for me. 4.) I’m thankful for a place to call home. 5.) I’m thankful for a vehicle that runs and has air conditioning in this blazing heat. 6.) I’m thankful for air conditioning! Otherwise, I’d be a permanent people watcher at the air conditioned malls or a hermit at the air conditioned library if we didn’t have our glorious A/C. 7.) I’m thankful for Ibuprofen. I woke up with a killer headache this morning. My head was just pounding. 8.) I’m thankful for a comfy bed to lay my head. 9.) I’m thankful for my Catholic roots. And last but definitely not least –10.) I’m thankful for YARN!! Click here to let us all know. Okay, maybe just to let me know. I’m nosey like that. And yes. For my yarn! I'm thankful for my husband. He's the most wonderful person ever. We always tell each other that it's only the two of us. We come first. I too am thankful for air conditioning. It was 111 here yesterday. Way too hot. I'm thankful that you're one of my blogging buddies. I, too, am thankful for A/C and for the friends I meet on the internet. I'm thankful that it's cool and rainy and that summer is over. Oh, I'm thankful that you're one of my blogging buddies too Sandee. ❤ I'm so happy you have a good man. I wasn't a very good picker in that dept. so I'm just done pickin'! 🙂 111 degrees, sheesh. I am sooooo ready for fall! I hope you had a great weekend. Hello! I was so happy to find you joining us at TToT this weekend! 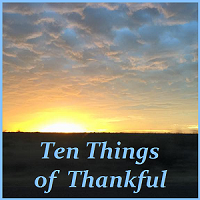 I love your list of thankfuls, all the good things that make our lives sweet and that we too often take for granted! Having children and grandchildren who are kind and loving means that they were raised being shown how to treat others, they are blessed to have you in their lives! Life would be so much less fun without the antics and unconditional love of our furkids, who always seem to know when we need to snuggle. Good friends are everything, a blessing in the hardest and happiest of times. We are even more aware after the terrible flooding here in Texas of how blessed we are to have a safe, dry house to call home, and yes, AC. I often wonder how we lived without it when I was growing up. Like you, it's a must have in my life! A dependable vehicle is such a relief too. I remember life before Ibuprofen when Aspirin or Tylenol often didn't take away the pain or soreness. I hope your headache went away quickly, they are no fun at all. A comfy bed is a pleasure to return to each night, ensuring a good sleep and hopefully sweet dreams. The faith and values we were brought up with are so important, they not only formed us into who we are, but give us the strength, courage and direction to keep going in the rough waters of life. Faith stands boldly in the face of fear! I had to smile at your obvious love of yarn, because I love it too… especially all the new kinds, colors, and textures available now as compared to when I was young and just learning to knit and crochet. I'm working on a requested lap afghan for Papa Bear, my beloved spouse, right now, and hope to have it done before cool weather sets in. I also love making wreaths. What is your favorite kind of project? I believe that busy hands are happy hands. I'm glad you have AC too. We have an earth sheltered home (kind of built into a hillside) so it stays cooler in the summer than most homes without air conditioning, but with so many days of high temperatures, even this home is much hotter than is comfortable at times. Having air conditioned malls and libraries are helpful, especially for some of the people who are homeless on such hot days. Comfortable beds are so helpful to inviting a good night's rest. I hope you don't get headaches often. To wake up with one must be miserable. Although I am not Catholic, I appreciate my grandmother who let me browse her Catholic magazines when I was a young girl, and who introduced me to the nuns who visited her. I remember witnessing my grandmother praying with her rosary and how quiet I needed to be while she did this. Hi! 🙂 Thank you for your kind words ❤ This post could've been a million miles long but I'm saving some for next week. 🙂 - My favorite yarn projects are afghans of all shapes and sizes but I have to say. I'm partial to the granny square because I'm really a hippy at heart and I remember granny squares being *the* thing back in the 70's. 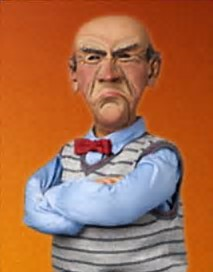 - I'm old. - I bounce between yarn and my Cricut. It's a draw on which one I like more. I haven't made wreaths since the days of all things glue gun and all of the stringy strands and burnt fingers! Hahahaha. I would love to see yours tho! Thank you. 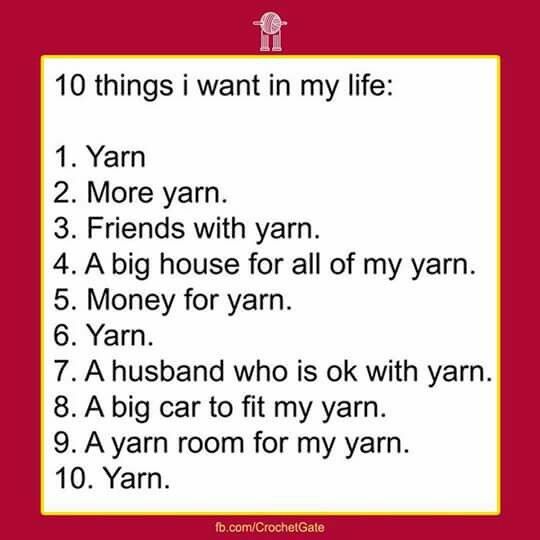 Seriously, where would we be without yarn?